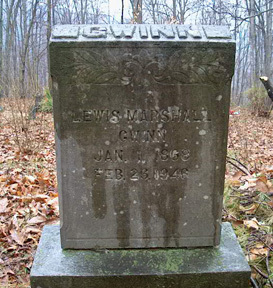 Son of Lewis W. Gwinn & Elizabeth Kaylor Gwinn. Never Married. Funeral services will be conducted at 2:00 o'clock Wednesday afternoon at the Ronald Meadows Funeral Home on Temple Street for Marshall Gwinn, 81 of Meadow Creek, who died Monday morning in the Hinton Hospital. The Rev. H.P. Hackney, pastor of Central Baptist Church will officiate, and burial will follow in the Meadow Creek Cemetery.